Pope's Harley Goes Up For Auction To Help Rome Soup Kitchen : The Two-Way The pontiff was given two Harley-Davidson motorcycles in June, one of which will be sold in Paris to raise money for Charitas Roma. 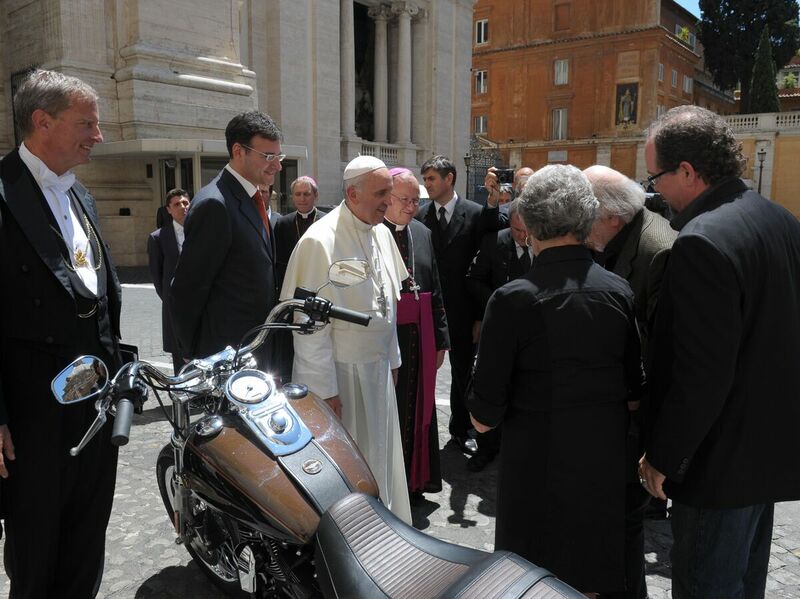 Pope Francis stands by a Harley-Davidson he was given, at the Vatican in June. The bike is to be sold at auction to raise money for charity. The Vatican plans to auction off one of Pope Francis' two Harley-Davidson motorcycles and donate the proceeds to a soup kitchen that feeds the homeless in Rome. In June, the pontiff was given two of the iconic motorcycles by the Milwaukee-based manufacturer. At the time, he also blessed a thundering parade of the bikes in Rome in an event to mark Harley-Davidson's 110th anniversary. The auction, set for Feb. 6 at the Grand Palais in Paris, offers a 2013 1,585cc Harley-Davidson FXDC Dyna Super Glide Custom signed "Francesco" on the fuel tank. The money raised will go to Charitas Roma for the renovation of Don Luigi di Liegro hostel and soup kitchen based at Rome's Termini railway station. It's unclear whether the pontiff ever rode the motorcycle, which sans the pope's signature is estimated to be worth $16,000-$20,000. But Ben Walker, head of motorcycles at auctioneer Bonhams tells Reuters: "I suspect that it will (have) very limited mileage." "We hope to be able to do both Pope Francis and Harley-Davidson proud by raising a significant amount of money for a very worthy cause," Walker said. A leather biker jacket also given to the pope and later signed by His Holiness will be sold separately, according to Reuters.